Making a quilt can be a wonderful project to try, however sewing one by hand can be a nightmare. The best option is to use a sewing machine, however to make sure that your machine quilting project is successful you need some helpful tips to set you on the right track. Preparing your machine with the correct pressure foot and setting is just the first step,and ensuring that you are using the right type of sewing machine couldn’t be more important. Using a specialist quilting machine rather than a standard sewing machine is essential as it will have been designed to meet the specific needs of quilters. You’ll have the essential features you require to complete your quilting project with ease, such as a free arm, knee lift and free motion function, and you’ll also have sufficient space on the table to accommodate your work. Here are some tips to getting started with your quilting for beginners project. When preparing a large quilt project, ensure there is a large surface on the left and to the rear of the machine as this will ensure the weight of the quilt is properly supported. You don’t want your machine to be pulled onto the floor by the weight of the quilt! Lay your based quilt down on the floor. Roll its sides into the center, with a 12” central area of the quilt unrolled. You will start quilting in this section. Secure the two rolls on each side with pins. 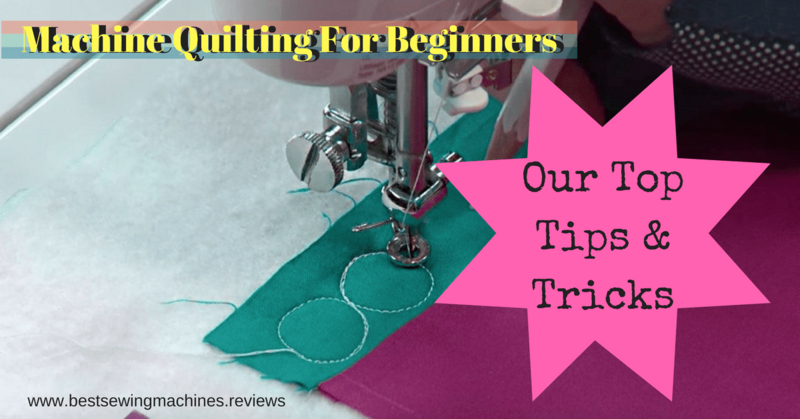 This is the simplest way for beginners to start their machine quilting project. It produces impressive results in very quick time. Fit an even-feed (walking) presser foot into the machine. This will ensure your stiches are pucker free and smooth since the quilt layers will be fed evenly through the machine. Without this foot type, the feed dogs will feed only the fabric’s bottom layer through your machine, with the top layers and batting at risk of puckering since they won’t be fed at the same rate through your machine. Thread the machine’s top with your chosen shade of thread. Should you prefer invisible stitching you can use nylon monofilament to be your top thread. Load your bobbin with either a matching or contrasting all-purpose thread. Put the center part of your quilt (the part that hasn’t been rolled) into the machine and make a single stitch. Keep the needle up while you stop and raise up the presser foot. Pull the tail of the top thread so that the bobbin thread’s tail appears through the stitch that you just made. This will leave both of the tails on the quilt’s top layer. Put the presser foot down then start stitching. Make 2 stitches then stop. Put the machine into reverse then take two stitches back. This will secure your thread properly. Now continue to stitch normally (no reversing is required) along the lines you have marked. When you arrive at a corner to be turned, lower your needle into your material, raise up the presser foot, turn the quilt to the other direction then lower down the presser foot and continue stitching. If you reach an area where you want to stop stitching, reverse the machine to take 2 stitches back in order to secure your thread. You must do this each time since otherwise your stitching could unravel. Once you have quilted the unrolled section of the quilt, remove your project and unroll a side to expose an area you haven’t yet quilted. Repeat until the whole quilt is stitched. Although it may take a while to master this skill, you will find top tips here to help you learn how to free motion quilt. This type of quilting makes beautiful fancy patterns, with the possibility of floral and curved designs. You will need to use a free motion or darning foot for this type of project. You will also need to disengage the feed dogs. You can do this by either turning a dial or cover them up with a plastic or metal plate. You won’t need to make any adjustments to your straight stitch length at all with free motion quilting as the speed you are sewing at, paired with the speed you’re moving the quilt will determine the length of your stitches. Put the quilt under your presser foot. Keep one hand on either side of your quilt, around 2” from your presser foot. Guide your quilt in your chosen direction under the presser foot. Stitch slowly, taking a few stitches over the same spot so this secures the thread. Move your quilt as you stitch, guiding it in your chosen direction with both hands so the needle is following your design or marked lines. Keep to a steady speed, moving the fabric smoothly and slowly to avoid gaps or over-long stitches. Practice free motion quilting on small projects first before moving on to a quilt. Although it may sound difficult to begin your quilting project on a sewing machine, with practice and a little hard work, you’ll soon master the art. However, you should always use a special quilting sewing machine if you want to ensure the best possible finish, since a standard sewing machine will be very frustrating to use for a large project of this type. Without the necessary features, you could well end up giving up on your first quilting project before you’ve barely started if you use your regular model! If you’re looking for the best quilting sewing machine for you, read our buying guide and find out more about the best models on the market today. You’ll learn more about the different features to look for in a quilting sewing machine and find a machine that fits your needs perfectly. Previous Post Computerized Sewing Machines: What’s All The Fuss About?